Make photos from your phone even better with the simple and intuitive Ztylus Stabilizer Rig Kit. Smartphone cameras have come a long way in a short period of time, but there is still one major limitation: Your hands. Keep steady for every shot you take with the help of the Ztylus Stabilizer Rig Kit for Smartphones, on sale now for 26% off the retail price. Blurry photos taken by jittery hands can be a thing of the past when you lock your phone into the Ztylus Stabilizer Rig Kit for Smartphones. 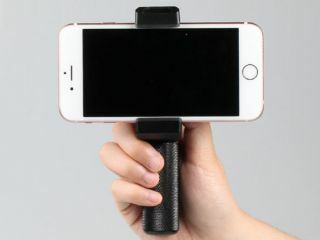 This smartphone grip makes sure you always have a tight hold on your phone and prevents it from shaking as you take the shot. Its ergonomic build makes it comfortable to hold and easy to attach to a larger tripod if you want to take a stationary shot. The Ztylus Stabilizer Rig Kit for Smartphones usually retails for $29.95, but you can get it on sale for just $21.95 (approx £17). That's a saving of 26% off for a must-have accessory for any photographer on the go, so grab it today!